You were a very experienced business consultant prior to your MBA and your career seemed to be developing very well. What’s you reason to get back to school? Career progression was one of the reasons for deciding to do an MBA. But more important was to have the experience of studying and sharing experiences with accomplished peers. 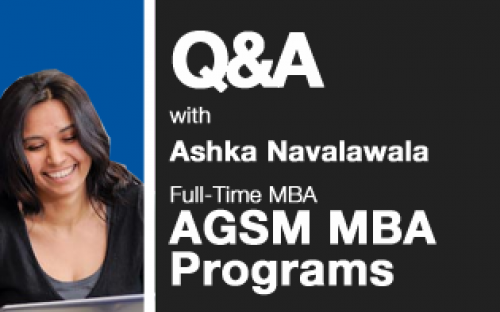 My learning has been tremendous because of the diverse student body of the AGSM MBA. You worked for a few years before starting your MBA. Do you think your work experience provides you with extra motivation in the classroom? I worked for six years before my MBA. I think five to six years of experience prior to the MBA really adds to the learning that one gets in the classroom. Doing an MBA with little or no experience only gives theoretical knowledge, whereas after working for a substantial number of years I can actually relate the various concepts back to my work. For someone who has been to the US and Africa, not to mention working in Asia too, how did you end up choosing Australia? I worked in Australia too for sometime last year, which gave me a glimpse of the great life this country offers! I absolutely loved the weather, the beaches and the lifestyle. Coupled with this, the AGSM MBA’s ranking among the global b-schools made me apply to AGSM. Let’s go back to your study. Which class taught you the most at AGSM? I have found all subjects interesting, but Economics in particular has taught me about the way the world economy functions. It has also helped me to understand how and why the global downturn happened. Has the financial downturn changed the way you think about business? Absolutely. Profits are crucial for business, but it’s more important to stand true to your ethics at all times. You are the President of the AGSM Diversity Club? What would you like to achieve when you leave? As a diverse group of people, we respect and enjoy each other’s diverse backgrounds. One of my initiatives as Diversity Club president is to organise events to not only celebrate our diversity but also help us gain more knowledge about various cultures and business environments. I also organise talks that gives people a platform to share their experiences of working and doing business in countries different from their home country. This will help us tremendously when we work in different countries post-MBA. Lastly, where would your next stop be after AGSM? I plan to stay and work in Australia for a couple of years after AGSM to enjoy more of the Australian life! Why Go to Business School in 2013? Australian MBAs Earning the Highest Salaries! Top Business Schools for Bars!